Hei upeaa heinäkuun alkua ja aloitetaan heti Penny Black and More haasteella "kesän kukat". DT- korttini tein tällä kertaa miehelle, embossattuja kukkia, itsetehtyjä kukkia, kelloja...ja jotkut voivat tätä ihmetellä myös pitsiä ja helmiä ja perhonen. Tulkaahan mukaan, upeat palkinnot odottavat! Muistakaa osallistua myös karkkiarvontaani 10.7. asti! 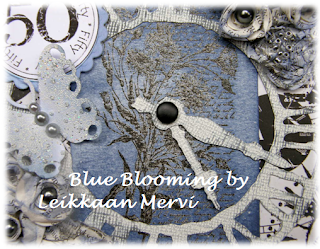 with lots of flowers - as our theme is Summer blooms! I made my DT-card for a man! And there's lace and pearls and butterfly, someone might think, for a man!? But why not. 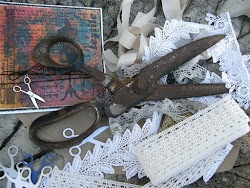 I made flowers from old book, sprayed them with blue ColorWash, little chalky feeling, add pearls inside. Butterfly is Joy Crafts die, embossed with white powder. Tim's clock cut from whitewash cardstock, brad, so the hands can be moved. Background time paper is 7gypsies with light blue ColorCore cardstock. Penny Black Stamp "letters and flowers" is one of my favourites, so versatile stamp. This time it's stamped with black versafine and embossed clear, then inked with Distress Inks. Please join us, cause we have the fabulous prizes again and look the gorgeous samples my teamies made. Remember to entry my birthday candy, open till 10.7. I think it's a great card for a man Mervi, the colours and TH clock give it a really masculine feel. Really lovely card. Thanks for playing along with us at Charisma Cardz this challenge! I really love the shade of Blue you have used. It is one of my favourite colours. A stunning card and perfect for a man. 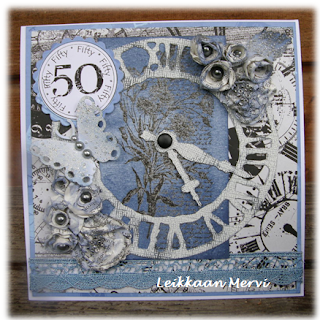 A stunning card Mervie! Love the blue colour. The flowers are beautiful. What an amazing card! 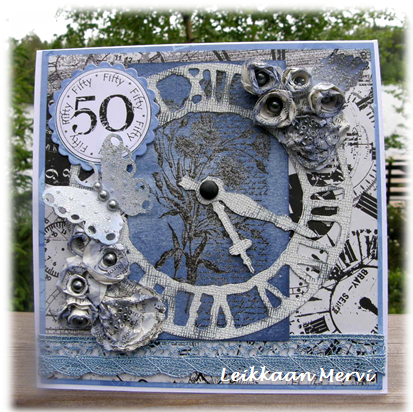 Loving the way you used the clock diecut with the designer paper. Gorgeous colors too! Siis tämä korttisi Mervi, on aivan HURMAAVA!Todella taidolla tehty! Kiva, kun osallistuit Vintage ja Beauty -haasteeseen. Älä unohda osallistua upeaan namuumme TÄÄLLÄ. Se on voimassa vielä huomiseen klo 21.00 asti. Oh what a fabulous card, love it. Voi hyvänen aika kun on KAUNIS!!!! Ihanat värit ja mahtavat koristeet!Kiitos kun osallistuit It's All About The Vintage & Beauty haasteeseen! Onnea arvontaan! Meillä on myöps bloginamu blogilla, johon on vielö pikkuisen aikaa osallistua! Pretty, thanks for playing @ CTO Birthday Challenge! This is totally gorgeous mervi, I love it! Hi Mervi, what a sensational card, love all of the gorgeous elements here and the lovely colours just perfect door our challenge at Crafty Cardmakers thankyouy for sharing this beauty with us and good luck. Love this piece. The vintage distressed look is right up my street and I like your colour palette. this is just gorgeous and so beautifully done! sorry i haven't been sooner to comment; was not well. CSAYL #20 DT- Any Sketch!